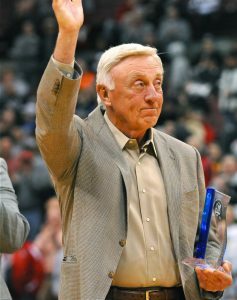 MLB Legend Phil Niekro spoke at the Chamber of Commerce Banquet last month on April 21 in Barnesville, Ohio. His main message was stressing just how important it is to work as a team all the time, whether or not you play a sport, and emphasized that giving up should never be an option. He Niekro told the group that “winners never quit, and quitters never win”, as he highlighted some of the challenges in his life and discussed some of the experiences he had playing at Bridgeport High School. Niekro was a huge inspiration to have at the event, and even the president of the Barnesville Chamber of Commerce commented that having the former MLB great speak at the banquet likely motivated locals to invest in their growing and thriving community. The Blaine, Ohio native got his start in playing sports during his high school years when he added Bridgeport High School, which has since renamed their baseball diamond after him. His brother and fellow professional baseball player, Joe Niekro, and he learned how to pitch from their father right in their own backyard. In 1959, Niekro signed on with the Milwaukee Braves for just $250, and pitched for many AAA teams for the next few years until his MLB debut in 1964 for the Braves. He stayed with the Braves until 1983 and then went to play for the New York Yankees for a couple of years. In the final year of his professional career, Niekro bounced between the Cleveland Indians, Toronto Blue Jays, and Atlanta Braves before his official retirement in 1987. The five-time winner of the Golden Glove Award spoke to a group of people near his hometown for the Chamber of Commerce banquet a few weeks ago. The community of Barnesville is growing pretty quickly, and management of the Chamber of Commerce believe that Niekro’s motivational speech will give locals for confidence to invest in their own hometown. If your company is interested in finding out availability and booking fees for a former professional baseball player like Phil Niekro or other sports celebrities for a Keynote Speech, Fundraiser Event, Guest Appearance, or Baseball Camp, call us at 1-888-246-7141.